This Monday students will be entering my school for the 2013-2014 school year. Classrooms have been buzzing with movement all this week. The sound of bulletin boards being put up, desk being moved, pencils being sharpened, and some major cleaning has all happened during the last few days. Friday’s in-service day covered the topics of security and community. This year the district and state have decided to focus on social/emotional learning standards and making sure students feel like they belong, not just attend school. It looks like eventually school AYP will be connected to school climate data. Teachers were asked to keep this in mind when starting the school year and setting up their class. Generally I’m not a fan of filling in all my wall space before school starts. I like to leave some major room for student work as the year progresses. Below you will find a few photos and short explanations of my class setup this year. I decided on changing my desk setup after reading this inspirational post. 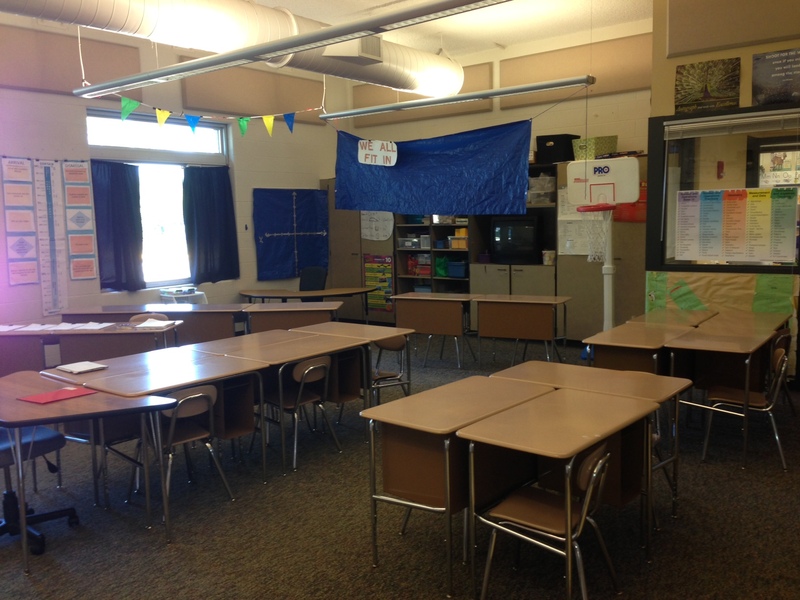 My class now includes connected rows and group tables. Students usually pick their own desk to start the year. Students randomly switch seats approximately once per month. I find that a combination of rows and tables is conducive for a lot of group work that takes place in class. As soon as students enter the classroom they take a sharp right turn and see what’s in the picture above. 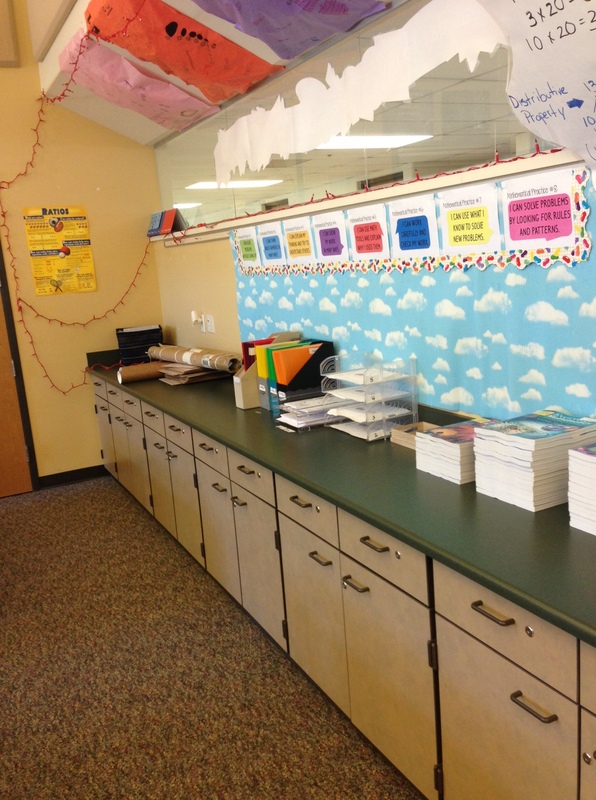 Students turn in their homework/notes and pick up their math folders. Students then sit down in their desks and work on individual assignments in their folder or directions that are displaced on the whiteboard. Community building and procedures are emphasized during the first few days of school. I’ve used the right and left charts in the past to remind students of the procedures used in class. The middle poster is a percentage/stats/probability that’s used with my math curriculum. 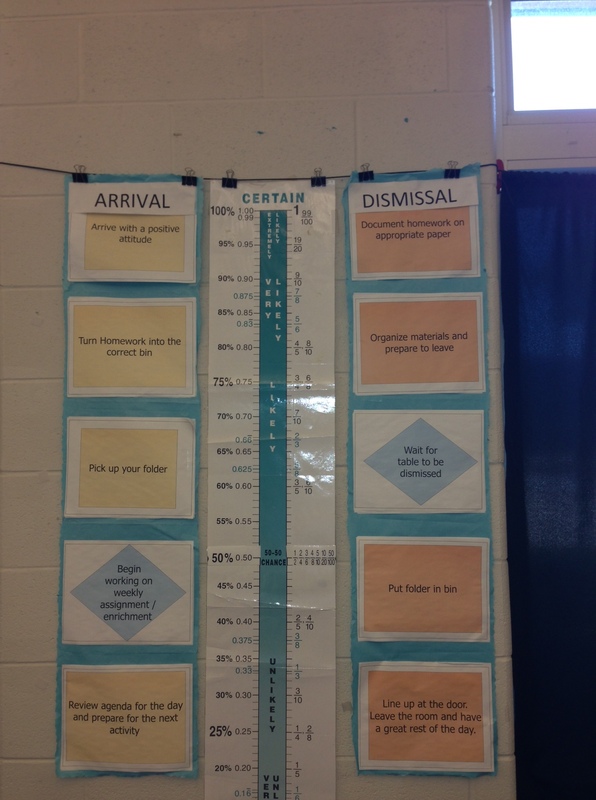 Using the arrival and departure charts helps maximize instruction time and learning. 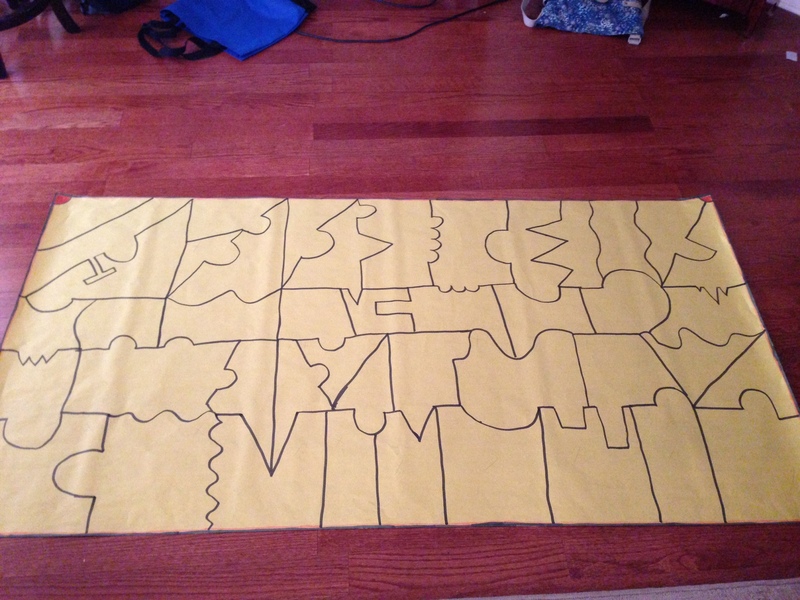 This blank canvas is filled with a completed puzzle by the end of the first week. (example) The puzzle is cut out by the teacher and each student fills out their own puzzle piece. On each puzzle piece, students put their name, favorite math topic, one activity that they participated in over the summer and whatever else you’d like them to write. 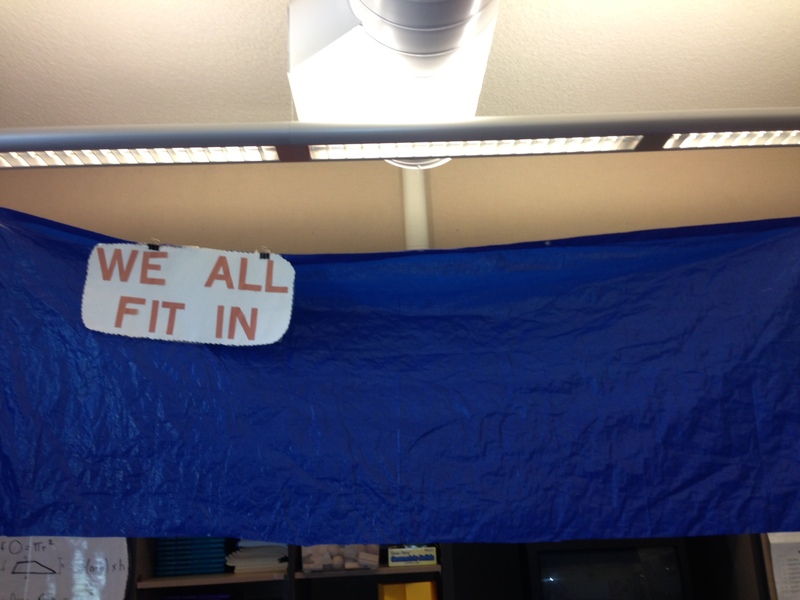 Students then put the puzzle together and it fits right on the blue tarp for the remainder of the year. This activity also gives insight to the group dynamic makeup of your class. I put my excess tarp into use as a bulletin board. The lines were actually constructed with thin duck tape. 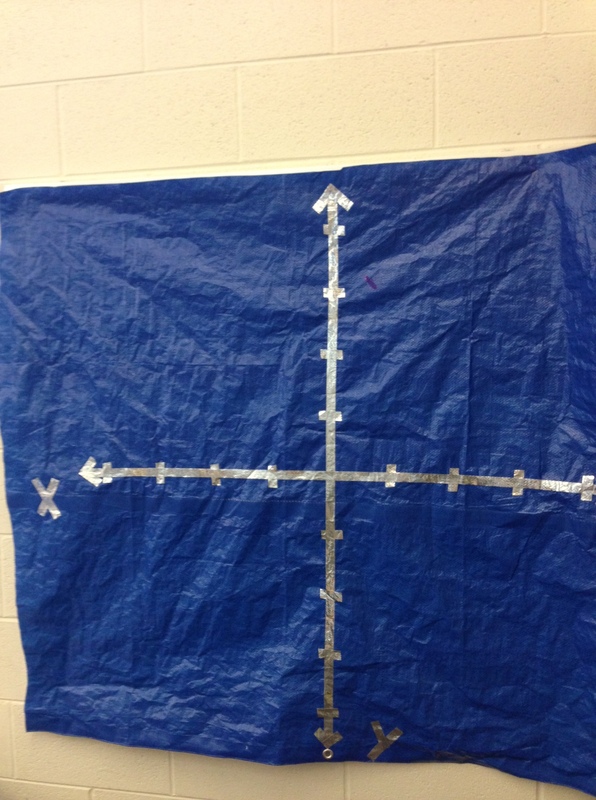 This grid will be used throughout the year for our algebra units. At some point I want to have some type of “genius board” in the classroom where students can ask questions about math topics. Eventually the questions will spur topics that will lead to our genius math projects.